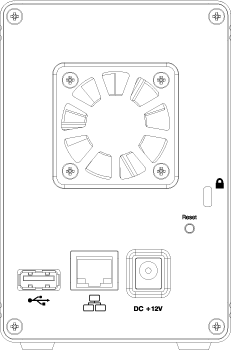 The MyCloud Duo is designed for two desktop 3.5“ SATA hard drives. It provides safe and secure network storage plus the ability to easily share your digital content with family and friends. Stream content within your local network to any available UPnP-AV and DLNA device (e.g. PS3, iTunes, Windows 7, etc.). Remotely access your files through any internet connected computer or through our free iPhone, iPad and Android apps. Press and hold the copy button for one second to copy the files from the USB drive on the front port to the PUBLIC folder on the network drive. To reset the configurations (e.g. admin password and network settings), make sure the power is ON and the system is running. Press and hold the reset button for 5-10 seconds and then release it. Wait until the system LED stops flashing before attempting to login again. To reset the device back to factory default, press and hold the reset button for 12 seconds and then release it. After the reset, it will be necessary to manually mount the HOME and SWAP partition. Also, even though the private files of the other users can still be accessed by the admin, it will be necessary to recreate the previous user accounts before the users can login again and access their existing data. Connect the power supply to your device first and only then plug it into the wall outlet. The system starts up automatically as soon as you plug in the power supply. It takes about 1-2 minutes for the device to go online but the blue system LED will indicate when the system is ready. To safely turn off the device, press and hold the power button for about 4 seconds until the red LED starts flashing. The system will then shut down all services and about 20 seconds later, it will power down. If for some reason the system is unresponsive, press and hold the power button for 6 seconds to forcefully shut down the system and cut off the power. If the device is not in use for long periods of time, we recommend that you turn off the device and remove the power supply from the wall socket. Remove the screw at the bottom of the case and lift the front panel upward and away from the housing to remove it. 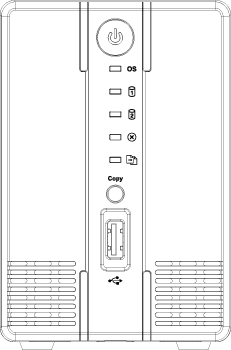 Install the hard drives as illustrated below with the top of the drives, where the label is located, facing each other. Push the drives lightly into place and then replace the front panel. Mount the front panel and the drives by fastening the screws at the bottom of the case.